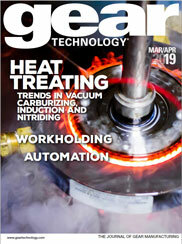 The article "Gear Expo 2013 - An Oscar-Worthy Indy Production" appeared in the August 2013 issue of Gear Technology. We are well into an odd-number year, so it must be just about time for another Gear Expo. Indeed, the big show -- Gear Expo 2013 -- kicks off in Indianapolis at 9:00 a.m. Tuesday, September 17, wrapping up Thursday the 19th at 4:00 p.m. And whether you are exhibiting or attending, the bottom line is you are going -- a good thing for you, your company and the tightly knit U.S. gear industry. The article "Gear Expo 2013 - An Oscar-Worthy Indy Production" should appear in the box below, but if you do not see it, you can download it here.